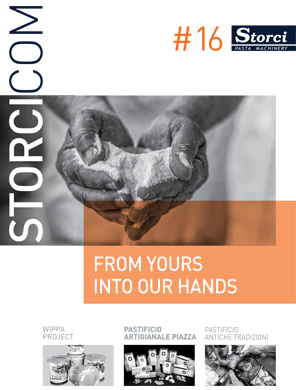 Storcicom is our magazine, an instrument to tell you about ourselves with no limits and obligations, a mean of communication to draw attention and show our true image. An easy way to get to know our production, our technology and know-how. Find out all the news and download all our editions for more in-depth information. Scrap recovery system: how to smartly re-use trimmings. Tortellini shaping machines: innovative solutions for fresh pasta, even gluten-free. 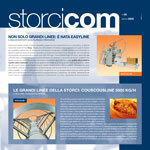 Moreover: this edition highlights two of our Italian Customers, from Sicity to Gragnano (Naples), read all our interviews. Do not miss the latest news about WIPPA, Instant Pasta Makers Association: preview information and the story of its birth. The XV edition highlights ready meals and new trends, lasagna-cannelloni and multi-product process lines, customized plants for any needs. We are going on with our President’s biography…get a sneak peek of an extract while waiting for its publication. 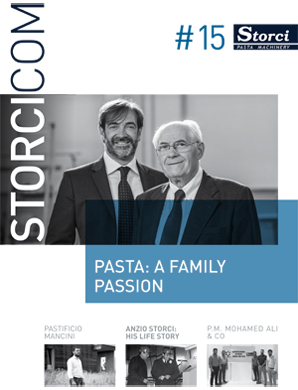 Moreover: Pastificio Mancini and P.M. Mohamedali & Co., from Marche to Sri Lanka, they tell us how come they choose our technology. 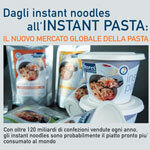 Don’t miss the news about high temperature and pasta world trends…. Enjoy it! XIV Storcicom edition: featuring international markets and focusing on Midlle East, prospects and potentialities of this market. 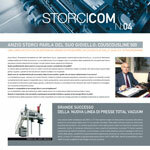 Read the interview to Michele Storci. Moreover: attention drawn to some Italian Customers. Find out which one! 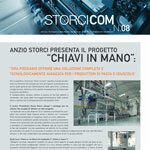 Drying chambers news and an article about Pasta Museum... we won't tell you anthing else, download the last edition! Two editions in one this year! In the XIIIth edition, still focus on our Customers: the same attention and care are given to pasta factories needs, either in Italy and abroad. Furthermore, featuring Training Center and so many information about our dough cooker…download the pdf and …enjoy! 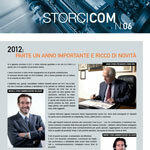 New layout and graphic: Storcicom refreshes its look! Focus on our Italian and foreign Customers, that have always been our strength! In this edition we are also featuring an interesting article about Omnia line, the latest news from the Training Centre, and…. that’s all, we won’t let anything else out! Open the pdf to read the news! Top stories: instant pasta and gluten-free lines. Our Customers: Pastificio dei Campi and Sarl Mis Moulin Industriel de Sebaou. Would you like to produce ready-to-eat lasagne? Our line is the answer! Furthermore: read our section: “A chat with…” find out who answered our questions! All the advantages of our turnkey solutions! Complete and personalized solutions to meet all your needs. In the section dedicated to our Customers: Pastificio Fabbri and Sarl Moulin Bouguerra. 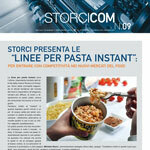 Read about our winning duo with BS Company in Parma: ready meals to the highest standard! 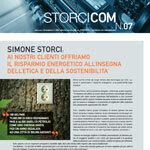 Energy saving in the pursuit of ethics and sustainability: this is the fil rouge that guides our Storcicom VII. Read how to save energy, thanks to our Beltmix, and, in the meantime, how to produce a pasta of better quality! 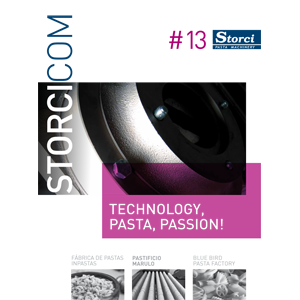 In this issue you can also find interesting information about our Customer Service, the WD presses and other topics, not just about the world of pasta! We are celebrating 20 years of activity! 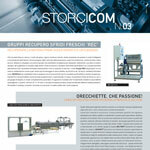 An important goal achieved by our Company, twenty years of passion and innovation in the world of pasta machinery! We look back on our origins, the duo with Fava and what has been achieved so far…. Moreover: Massimo Mancini tells us of his production using our Omnia line; our machinery: focus on the STF sheeter…read more! 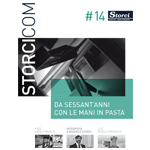 Storci Fresh Pasta System: technologies and innovative systems for each phase of fresh pasta production. Whether it be filled, fresh pasta, regional or laminated pasta, we are at disposal to satisfy all your requests. 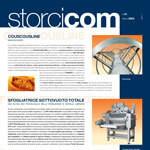 Furthermore: “In pursuit of America”: Storci lands on North-American market, read the article! Ready meals: a quick and tasty meal produced by Food Valley Company using our lines…. 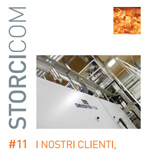 An overview of our machines for all productions: dry and fresh pasta, couscous…. modern machinery keeping a watchful eye on tradition. RECs: recovery scraps units that enable you not to throw away the scraps of your pasta production… because nowadays recovering the raw material is a must! 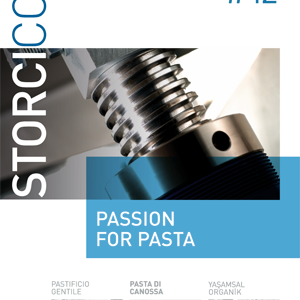 “We love orecchiette!”: Storci lines for regional fresh and dry pasta production! The new Research & Development Centre has been inaugurated: a step forward for Storci aiming to fully meet the needs of its Customers. We are at Customers’ disposal for testing new machines and products, always assisted by our qualified personnel. Omnia: multiformat and compact line, the right answer for those who would like to produce a wide range of pasta shapes.